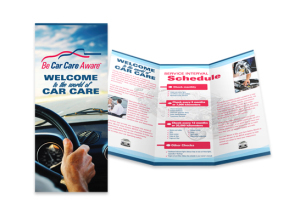 Be Car Care Aware offers various printed items and materials to display or use in your shop and hand out to your customers! Orders can be placed through our e-store. This 74-page full-colour booklet (with branding opportunities for our program sponsors) is the perfect give-away for your customers. The guide, which uses easy-to-understand terminology, is designed to be a companion to the owner’s manual to educate your customers about basic maintenance needs and when to come in to your shop. Hand copies out at your next car check event or make them available in your shop. 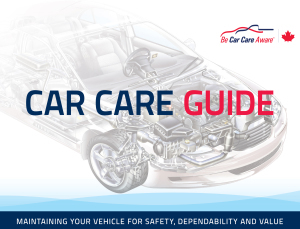 The Car Care Guide is available in bulk orders (select the bulk option on the drop-down menu in the e-store). Take a look! To view the Guide in electronic, mobile-friendly flip format, please click here. Customize it! The Car Care Guide can also be co-branded. BCCA program sponsors can order Customized Car Care Guides with their logo and contact information! Please visit the Sponsorship page to learn more. This full-colour informational brochure (with branding opportunities for our program sponsors) is a great reference tool for your customers that features a service interval schedule and a full vehicle system component diagram. Hand out a copy with each invoice or display some on your counter in a Be Car Care Aware brochure holder. The Service Interval Brochure is available in bulk orders (select the bulk option on the drop-down menu in the e-store). Take a look! To view the Brochure in electronic, mobile-friendly flip format please click here. Customize it! The Service Interval Brochure can also be co-branded. BCCA program sponsors can order Customized Service Interval Brochures with their logo and contact information! Please visit the Sponsorship page to learn more. Display this large laminated full-colour service interval poster in your waiting room as a reference for your customers. The service schedule will remind them when they should book their next visit. Use this high-gloss, laminated service schedule counter mat as a reference when explaining maintenance needs to your customers. Showing them the schedule can help to back-up your recommendations and build trust. Display the large full-colour vehicle component poster with schematic in your waiting room as a reference for your customers or use it as an educational tool when explaining service jobs. Showing a customer what parts need to be repaired and where they are on the vehicle can help them feel more confident about the maintenance work being done. Use these 41-point vehicle inspection forms when completing an inspection to inform your customers about what work is suggested, recommended, or required. Keep one of the triplicate copies for your records and give a copy to your customer so that they know when to come see you next.